A flathead-powered Harley-Davidson is an antiquated oil-dribbler suitable for nothing faster than being parked in a museum, right? Tell Paul Friebus, who rode a flathead to a record speed of 180.659 mph. He laughs, but he's at least half serious. This speed thing appears to run in the family. Friebus’ father set a speed record in 2008, on his 83rd birthday. Friebus holds about 30 records at Bonneville and also has a few ECTA records under his belt. He last ran in both the 500 cc and 1,000 cc M-VBG and M-VBF classes, and is eagerly awaiting the next run out on the salt. (Speed Week was cancelled in both 2014 and 2015.) His 180-plus run means Friebus has piloted the fastest flathead Harley in the world. That's not just old junk. That's the remains of a jug that blew apart while Friebus was testing it on his in-house chassis dyno. He's making so much power in these old bikes that sometimes they let go in spectacular ways. Fortunately, he wasn't injured badly. Paul recovered most of the pieces that entered his leg. Friebus now "birdcages" his cylinders, pinning steel rods into their fins to help control the damage and explosion of debris that can occur. Check out the intake and exhaust ports, too, gearheads - that's late model Evo Sportster stuff. Photo by Lemmy. At age 59, Friebus is younger than most who specialize in the old side-valve engines, but there's a story that explains that. Friebus grew up in South Africa. During World War II, Harley-Davidson supplied the armed forces of South Africa with even more Big Twin flathead-powered motorcycles than were produced for the United States. Years after the war, you could still buy one, in running condition, for nearly its scrap value. Because the flatheads were so cheap, Friebus snapped them up, and shortly thereafter, he set about making them go faster. He blew some up, but he quickly began learning the secrets of speed the antiquated engine design held. “The most I ever had was 22 Big Twin flatties, some with sidecars,” Friebus recounts. Friebus is converting a late-model "65A" generator for use in an earlier engine. Photo by Lemmy. The flathead engine was not a promising design, performance-wise. That changed when famed piston-engine researcher Sir Harry Ricardo began working with them in the 1920s. Ricardo discovered that some minor modifications to the flathead design enabled the engine to produce a fair amount of horsepower, paving the way for the flathead’s reign of motorcycle and automotive dominance right into the 1950s. Flatheads were cheap to produce and made good use of the fuel and metallurgy available at the time, but power was never a strength of the side-valve engine. Faster road speeds, better metal, and more reliable gasoline ushered in the new overhead-valve design, which brought better reliability and more power. Harley-Davidson last produced the big flattie in 1948. One of Paul's military bikes, in original trim. These days, this bike is pretty rare, so I always feel like it's a special treat when I get to see this rolling, running piece of history. Photo by Lemmy. In 1994, Friebus moved to America. His skill with the side-valve platform did not go unnoticed, particularly as he gained attention with his racing exploits on the salt flats. Today, Paul owns a small shop in central Pennsylvania called American Cycle Fabrication, building flathead engines and supplying parts. He is personally responsible for keeping flathead-powered Harley-Davidsons alive and pounding the pavement around the world. So while the racing is fun, it's also good for business. It’s pretty obvious to just about anyone with a few brain cells knocking around that Paul knows some secrets about building fast, tough flatties. The WL was Harley's little flathead, ringing in at 45 ci of displacement. This one quietly awaits its turn on the lift. Photo by Lemmy. American Cycle Fabrication will build nearly anything, but the shop specializes in Shovelheads and earlier bikes. “The oldest we’ve done is a ‘29 RL,” Silva proclaims proudly. Reliability is a priority, Friebus is quick to point out. "We strive for perfection in vintage cycles," he states. "A lot of that starts with oiling reliability. I can't tell you how many flatheads I seized up as a kid. They were terrible with heat management." Friebus has developed a special machining process for flathead oil pumps that doubles their two-vane pump's capabilities. 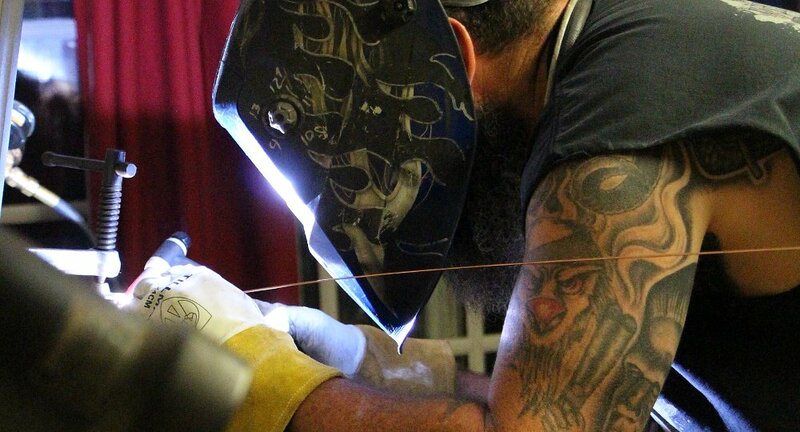 Four-vane oiling has proven to be an amazingly popular service at his shop, and the results speak for themselves. The increase in both flow and pressure from the pumps is nothing short of miraculous. Oiling reliability, indeed! If you need it for a flathead, American Cycle Fab probably has it in stock. There's not a wasted inch of space, and parts are organized impeccably. Photo by Lemmy. A walk around the shop is sort of like a museum visit and Friebus is a welcoming curator. He never seems to be too busy to talk bikes with someone, and Silva is no different. There are bikes and parts in various stages of assembly, and piles of highly sought-after vintage parts everywhere you look. And not a lick of space is unused. For a smaller shop, the inventory is massive, but all of it is organized methodically. It's a family operation, and if you come to the shop to request some work, Denise, Paul’s wife, will be your liaison. She’s patient, well versed in motorcycles, and unbelievably organized. Theirs is a quaint, personal way to do business. Perhaps it’s merely a throwback to the era of the bikes that the shop specializes in. Perhaps it’s just that being personal — and personable — is who the Friebuses are. 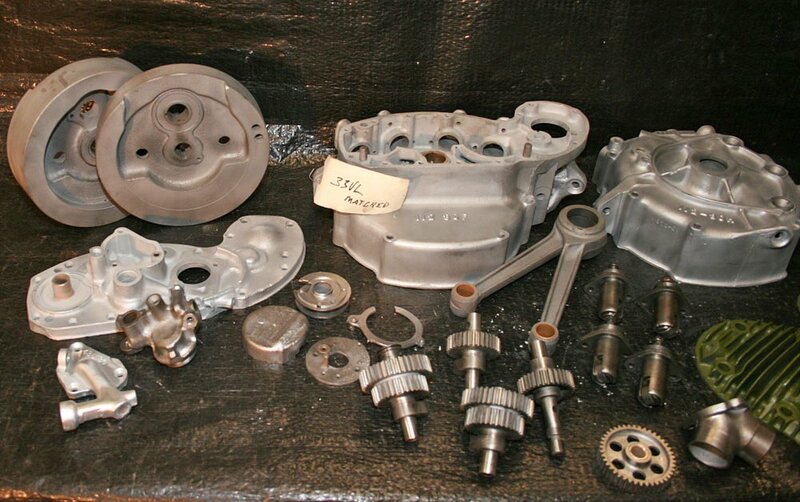 A pile of cherished four-bolt Linkert carb bodies, ready for rebuilding and a new lease on life. Photo by Lemmy. Before leaving, I asked Friebus and Silva what their dream motorcycles were, and their answers were unbelievably similar. Both want a streetable Big Twin flathead fed by a turbo. Paul makes it clear that his bike would be fitted with electronic fuel injection, while Silva longs for bags on his dream side-valve. I suppose they shouldn’t have much trouble building them, eh?